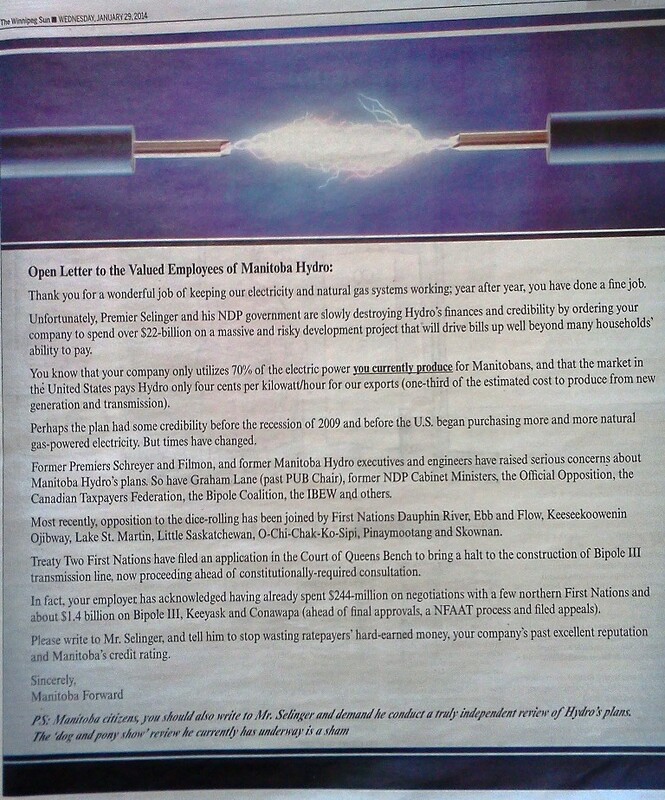 The ad starts by buttering up Hydro employees by telling them that they “have done a fine job”, then sets about explaining why their employer is going to shambles. Manitoba Forward? Who the hell is Manitoba Forward? God, I hope this isn’t a stunt by the PC party. Googling “Manitoba Forward” and “Manitoba Hydro” found a Policy Fix blog post about Bipole III, and about how Premier Selinger will “move Manitoba forward”. Coincidence? Sadly, yes. Policy Fix is a blog run by the Canadian Centre for Policy Alternatives. The left wing think-tank is a strong supporter of the NDP’s hydro megaprojects. Another dead-end. What about Twitter? Twitter never lets me down. Ah here we go: @ManitobaForward! There are no leaders and it’s still a loosely organized group. However, they do have material printed up and there will be a website: manitobaforward.ca. But hey, that means that the web site is related after all. manitobaforward.ca was registered on May 23, 2012, but I cannot tell by who. However manitobaforward.com was registered on the very same day by Jody Dundas of Suckerpunch Creative, a small Winnipeg web design outfit. Does that mean that a couple of Red River College CreComm grads are behind this ad? No .. more than likely they registered it on behalf of someone else. But whom? Brodbeck’s article threw around some names including Todd Dube of WiseUp Winnipeg (UPDATE: Dube is not involved with this campaign. See comments) and Peter Holle from the Frontier Centre for Public Policy. Are they still involved in this Manitoba Forward initiative? See, that’s the thing: we don’t know who the heck Manitoba Forward is, or what organization funded these full page ads in the Winnipeg Sun and Winnipeg Free Press, and that means that the credibility of these ads is weakened. They certainly make valid points about Manitoba Hydro’s projects. These projects make no economic sense with current realities of the energy market today. This is an issue that more people should be talking about. People are upset about cost overruns on the $210 million police headquarters in Winnipeg, but this $20-some billion Hydro plan has the potential of layering crushing debt on Manitoba’s largest crown corporation and impacting Manitoba’s credit rating, not to mention your hydro bills. Will these ads get people thinking about that? Maybe a little, but people (including myself) are rightfully skeptical about anonymous propaganda that mysteriously appears in your mailbox or newspaper. I am no longer part of this group. I wasn’t a fan of the anonymous approach aimed at impacting politics and/or policy. That is akin to shooting from the bushes. At the time – 2011/2012 – Manitoba needed a fresh political party – not anonymous critics. The Manitoba Action Party plan that followed was terminated after it became likely that Brian Pallister would lead a refreshed PC party back to power. Given the desperate state of Manitoba – we can’t afford to split the vote on the right. I have full confidence in Brian Pallister and look forward to working that election. Thanks for the clarification Todd. I have added a note to the blog post. The REAL problem with Hydro is the Secrecy and Duplicity with the REAL Information. You will be surprised to learn Hydro is OVER-Built Today … GOOD till 2060 ! TWO of the Biggest Customers are Shutting Down SMELTERS ! .. Freeing Up Megawatts ! HydroDebt50Billionby2020 I Am ! ….. HydroDebt60Billionby2022 ! closer to the kitchen you’ve always wanted.